Create a marketplace like Amazon, Etsy or Airbnb. How to? Launching your marketplace requires you to master certain very particular concepts, often unknown or difficult to tame. Let's take a look together. There has been a great buzz about how to create an online marketplace like Amazon, Etsy, or Airbnb basically for the reason that these marketplaces have already towered success in short span of time by adopting the marketplace model. You can also create a marketplace like Amazon, Etsy, or Airbnb easily. Do you want to create your marketplace or develop in this area? Before you begin, here are some things to know. But, first of all, let's know about what an online marketplace is. 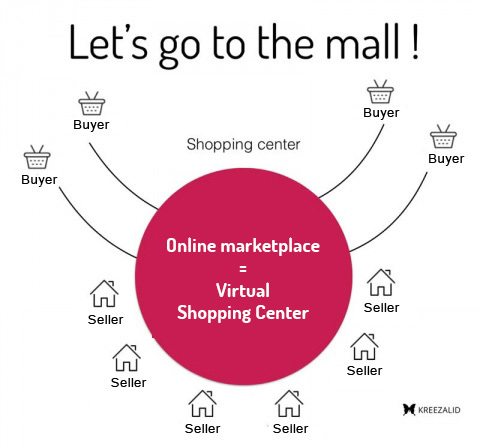 Actually, an online marketplace, also known as the "marketplace", is a virtual space for linking sellers and buyers. It's actually a kind of big online mall. In an online marketplace, multiple sellers can sell goods or services to customers. Examples of such marketplaces include Amazon, Etsy, Airbnb, eBay, etc. There are many sellers (hundreds of thousands, in fact) who can sell their products to the customers that browse the website. Conventional e-commerce stores usually sell the goods and services of one single brand, while an online marketplace has many sellers selling their products on the store, they have a greater product offering which can draw more visitors to browse the website. One of the main advantages of online marketplaces is that they draw in a number of digital foot-traffic, which can mean greater exposure for the sellers selling on that online marketplace. In short, marketplace means you have lots of sellers with lots of entries of products and customers which mean you will have a great amount of traffic in your marketplace. An online marketplace can also be referred to as a Collaborative Economy or a Sharing Economy for the reason that it’s usually made up of suppliers who work together to share or sell their idle assets or skills on a community-accessible marketplace. Again, marketplaces are usually focused around one particular niche, such as Amazon started as an online marketplace of booksellers; Airbnb started as an online marketplace to rent rooms, etc. Generally, marketplaces are more successful when they center around one particular niche since it gives customers a cause to shop there and while doing shopping there, they know what to expect from the sellers selling on that marketplace. That means, buyers have a choice; sellers can make their assets or skills profitable. There seems to be a more direct relationship between a buyer and a seller. The platform is managed by a trusted third party (the marketplace operator) who must ensure fluidity and secure interactions between different parties. Marketplaces like Amazon, Etsy, or Airbnb generally have all these features. Yes, you can create a marketplace like Amazon, Etsy, or Airbnb and the price may differ based on the above features. Amazon model: Marketplace reserved for professional sellers with a monthly fee for sellers and a commission on each sale. You can create a marketplace like Amazon with the help of Kreezalid. Airbnb model: Real estate rental marketplace with fixed fees for buyers on each rental. Learn more about Airbnb's business model. Kreezalid will help you create a marketplace like Airbnb. Etsy model: Unlike eBay or Amazon, Etsy has chosen a narrow domain of art, craft, handicraft, and handmade items. The business model is also exceptional as Etsy provides an amazing value to both buyers and sellers. Learn more about Etsy business model. Kreezalid will help you create a marketplace like Etsy. Comparing to a physical shopping center where there are a large number of buyers, marketplaces allow sellers to simultaneously reach a large volume of customers without spending money on marketing. It is, therefore, an interesting distribution channel for many sellers who refer their product or service offerings for free, without exorbitant logistical costs and with, most of the time, international visibility. For some, marketplaces are also a risk-free opportunity to digitize their business or to sell a dormant stock or sleeping inventory. Most marketplaces leave sellers free to bid and set prices. So it's a pretty flexible model. Do you have any products or skills to sell? Consider signing up now on a marketplace, you may well benefit from it. The marketplace is in a way the owner of this big shopping center. It is, therefore, the responsibility of the owner to attract customers and know the catchment area. And so marketing is a crucial element for this type of business, which is, above all, a volume-based model, indicating volume of supply and volume of purchase. Commission taking is an economic model primarily based on quantity and performance. Consequently, the marketplace will have to make every effort to offer the best visibility to the products referenced on the site. The marketplace must, therefore, include at the outset, a certain number of functionalities enabling it to efficiently fulfill its mission of linking. The offer is obviously what makes the attractiveness of a marketplace. A successful marketplace will, therefore, focus on quality offers, diversified and meeting the needs of targeted buyers. Actually, marketplaces are popular today and they are key players in e-commerce. Drastically changing the way we consume or contemplate ownership of a property, they offer many opportunities for innovation. To the point of being today, a business model is favored by companies looking for new markets. If this model remained complex, it has never been easier to create a marketplace. Kreezalid offers a turnkey solution for marketplace creation, in SaaS mode. As a technical marketplace expert, Kreezalid allows you to create an efficient and customizable marketplace quickly and affordably. When you have a clear concept of a marketplace, you can create a marketplace like Amazon or Airbnb, or Etsy more easily.